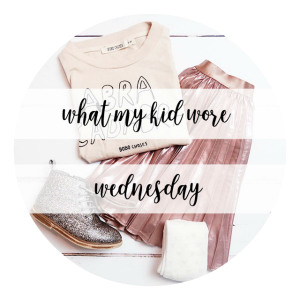 What my Kid Wore Wednesday| #3 | Merin and Co. This is my third What my Kid Wore Wednesday! The kids fashion linky hosted by Sarah, @Thismamalife and Hannah, @hannahjane_uk. I made a comment in last week’s post about how I hoped my lack of style wouldn’t impact my lovely little bub! Well, this week I went for it. Who said patterns couldn’t clash!? Well to be fair it’s not the worst pairing I could have gone for. I call this week’s outfit choice, “Bubbles and Bears”. We are yet again on the navy, grey and bear them. This time we have the added bonus of some very cute little coloured bubbles! I just love me a dribble bib! Socks: first size from Tu. I am loving the monkeys! Top: Tesco. This lovely, bear covered top is a long-sleeved gro and actually comes as part of the bear dungaree set. I really enjoy mixing and matching Heath’s clothes to give him new outfits! Joggers: George @Asda. They came as a pack of three varying navy and grey colours and they are just fab basics. They go with all of his clothes and are an easy and comfy go to for my little bub! It’s all about comfort in this house hold! This outfit, yet again, is definitely still conforming to the grey and navy choices I like. I’m going to challenge myself to input some colour over the next few weeks as my baby boy deserves some fun colours in his life!